When you first started your company, you were the human resources director…and the marketing director….and the operations director…and basically everything else. As your startup grew from a few passionate souls working their hearts out in a garage into a fledging business with its own workspace, HR duties might have fallen to an assistant with a hodgepodge of other responsibilities. Now, as your business begins to mature and you can no longer count your employees on one hand, it’s time to get serious about human resources. Every day that you don’t write an employee code of conduct, switch to a professional payroll software, or develop a benefits plan, you are increasing your liability and potentially scaring off high quality new recruits. As you begin this important transition, you’ll need to make some important decisions on how to address human resources responsibilities in your company. Do you need to hire a full HR department, or can you outsource some or even all of your HR responsibilities? If outsourcing appeals to you, then you’ll want to consider both HROs and PEOs, which are two different levels of professional HR assistance. In this article, we’ll review each of these concepts to help you determine which might be the best fit for your company. HRO stands for “Human Resources Outsourcing.” HRO companies can offer you a package of specific human resource services or even a la’ carte services. Are you looking for someone to take over your payroll, or do you need a company that can handle all recruiting for your growing company? An HRO is perfect for these situations! Most HRO companies offer just about every type of human resources need you can imagine, from benefits administration, to insurance services, coaching, and even on-site support for your employees. The HRO model of human resources outsourcing gives you the ultimate flexibility and control over your HR spending. It allows you to pay for only the services that you need. It also works great as a supplement to your existing HR team. If, for example, your current HR team is overwhelmed and needs help with back office work so that they can focus on the day-to-day needs of your employees, an HRO can fill this hole. Who Should Consider an HRO? You might benefit from an HRO service if you want to keep at least some of your human resource responsibilities under your own umbrella but don’t have the resources to bring on a full team. An HRO also works great if you need specialized help in certain areas that your current HR employees aren’t qualified to address. Finally, an HRO is ideal for business leaders who prefer the control and flexibility to request the specific services or service packages that they want. If, instead, you would rather simply hand off all your human resources needs, then a PEO is probably a better fit for you. If the idea of bringing on your own HR department in-house sends a shiver down your spine (the work involved! ), then the HR industry has an appealing solution for you. The Professional Employer Organization, PEO, functions as your complete human resources department. The PEO handles everything, from recruiting and hiring employees, to developing your benefits package, handling employee conflicts, employee training, and everything else. What makes a PEO even more appealing to many employers – and what really separates it from an HRO – is that a PEO takes on the liability for all your employees. In essence, the PEO is the legal employer of your staff; not you. This might seem a little uncomfortable at first, especially if you worry about losing control of your own employees. However, this arrangement can actually be very beneficial to you. If an employee believes she was fired unfairly and decides to sue, she won’t be able to sue you; she’ll have to take legal action against the PEO. In this way, the PEO gives you much greater safety against employee retaliation. The most obvious benefit of the PEO is that it accepts all liability for your employees, which takes a lot of worry, uncertainty, and risk off your plate. Additionally, hiring a PEO means that you don’t have to hire and manage your own HR staff. PEOs are experts in all things related to the human resources industry, so you can trust that all your HR needs will be competently handled. Not only will you save money on your HR needs, but when you can offer your employees a better benefits package (something most small businesses struggle with), you have a better chance of landing higher quality employees and earning their loyalty. If you don’t currently have an HR professional in your organization, now might be the time to consider a PEO. Rather than trying to build your own HR infrastructure one emergency at a time, you can seamlessly shift all of that responsibility to a PEO. This is also a good option if you don’t want to deal with the liability related to employee grievances or injuries and if you like the idea of a much simpler tax return! 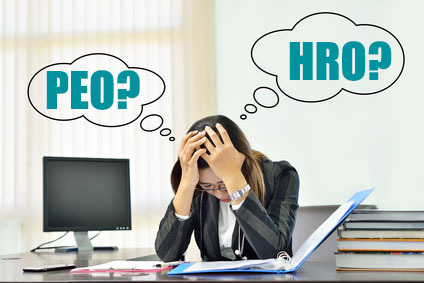 There really is no right or wrong answer when it comes to choosing an HRO vs a PEO. The best option for you will depend on what HR services you want, your budget, and whether you want to keep any HR responsibilities in-house. At Arch Resources Group, we offer both HRO and PEO services. We’d love to hear from you. Schedule a consultation, and we can help you decide which option would be the best for you.